Excellent customer service and impeccable attention to detail are the hallmarks of ORO’s commitment to it’s guests. Book your next event at ORO, and it’s sure to be a memorable one. ORO is pleased to host your next corporate or personal dining event. Whether it’s a standing reception or seated meal, ORO will undoubtedly make a lasting impression on your guests. Striking gold light fixtures and a shimmering glass-tiled fireplace add a bit of glamour to the ambiance, and upon entering, guests are likely to feel that something exciting is about to happen. 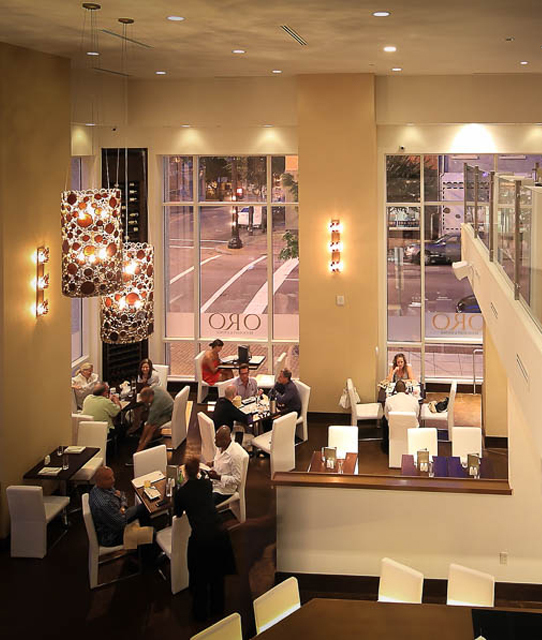 Our 3,500-square-foot downtown space evokes the cosmopolitan feel of an upscale establishment in New York or Chicago, yet with the welcoming warmth and character you would expect to find right here in Raleigh. ORO’s upstairs mezzanine can accommodate up to 40 guests for a seated meal and 75 guests for a standing reception. For larger parties desiring use of the entire space, ORO can accommodate up to 70 seated or 200 standing guests. We offer a variety of options, including buffet and plated meals, as well as passed hors d’oeuvres and stations. All dining styles can be accommodated in a range of flexible seating and serving options to suit your needs. When booking your group, a food and beverage revenue guarantee will be required. ORO does not demand a facility fee to simply use the space; rather the minimum must be met with the purchase of food and beverage. These minimums may vary based on the day of the week and time of year desired. Don’t be shy! Let’s us know if you have any questions. We are here to help make your dining experience perfect and look forward to hearing from you. Join our mailing list to receive the latest news and updates from our team. We promise to never share your email address and will only email you once a month.